Applications: Hold all Socatt system abrasive discs. Popular for localised work in industries such as automotive and aerospace. Product Notes: Socatt discs have a shallow metal fastening with a male thread, which is quickly inserted into the holder. This 'quick change' capability reduces downtime in busy workshops. The system also ensures central fixing of the disc. 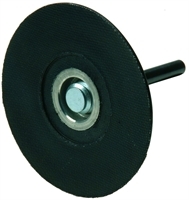 We stock medium (M) hardness holders in heat resistant rubber, which are ideal for a wide range of tasks from stock removal to fine finishing, (use less pressure for finer work). Choose between a 6mm spindle mounting (listed as '6') for many machines or M14 for 115mm (4 1/2") and 125mm (5") grinders. Also Available: We stock a wide range of Socatt Discs.